Orchids on display at Jardin Botanico. One of the reasons my friend Christine was in Colombia, and Medellin, in August was to interview me for a video documentary she’s working on about people who have a location independent lifestyle. In other words, people who make their living over the internet, and therefore can afford to work from a foreign country. 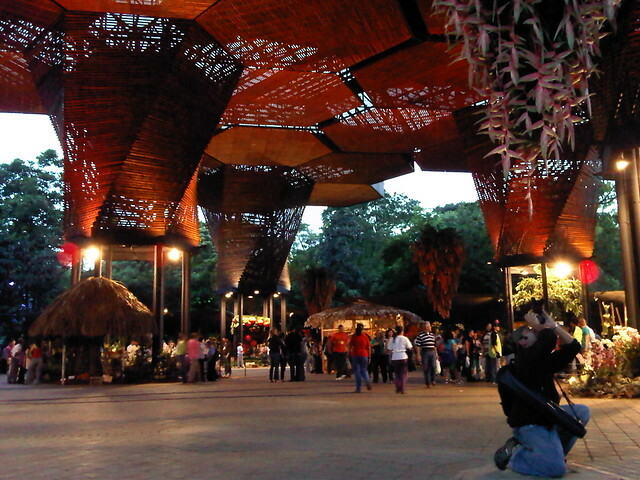 I’d set staked out Medellin in 2009, and returned for more in 2010. This year, Troy from FOGGOdyssey made the move from Quito, Ecuador to Medellin. A former US army guy and contractor in the Middle East, he’s now focusing on building a photography portfolio while making his money trading stocks online. Two different means to the same end. While I had my interview on the balcony of my apartment in Belen, Troy suggested Jardin Botanico for his. 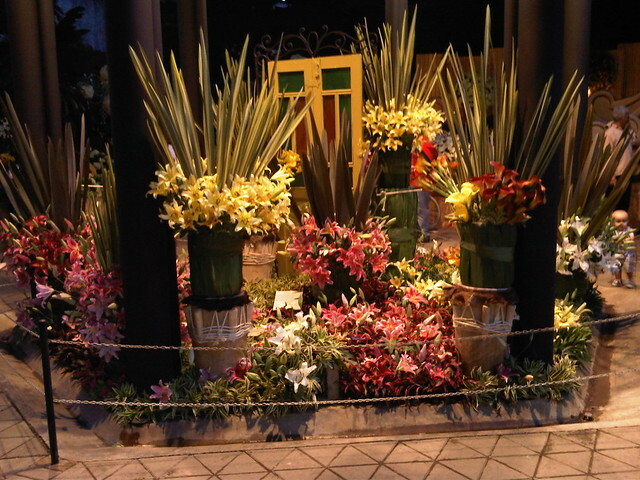 It just so happened that our plans coincided with the 17th Annual Orchid Show, which was part of the Feria de las Flores schedule. Troy photographs one of the hanging flower arrangements. We shot the interview by the pond first, so by the time we made our way over to the orchid displays, the light was fading. The architecture of the space is unlike anything I’ve seen before, and it’s hard to imagine a better place to host the flower show. While we were walking around, a producer for the local television station, TeleAntioquia, noticed Drew’s camera (Christine’s husband). Ana was with us, and she helped to translate as needed. They wanted to interview us…LIVE! Fifteen minutes later, we were being interviewed on live TV, which was being beamed across Colombia’s second largest city. One of my friends, Alejandra, later told me she saw our interview! 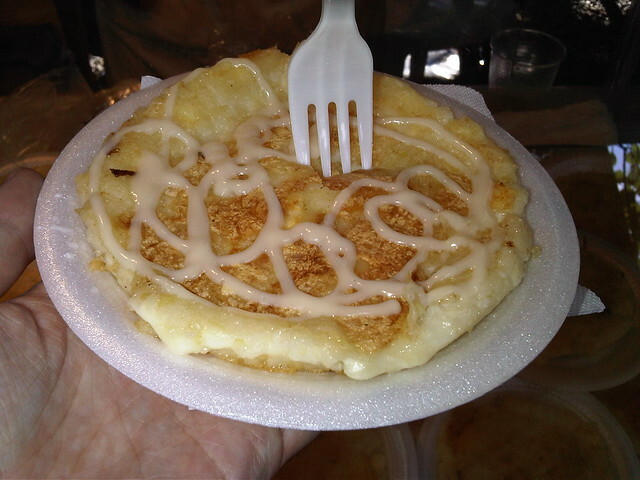 Snack time: arepa con queso y lecheria (sweetened condensed milk). In addition to the flowers on display, there were plenty of stands selling traditional, locally produced foods and clothing, such as Panama hats. Normally, entry to Jardin Botanico is free, however on account of the Orchid show, there was an entrance fee of no more than $5. 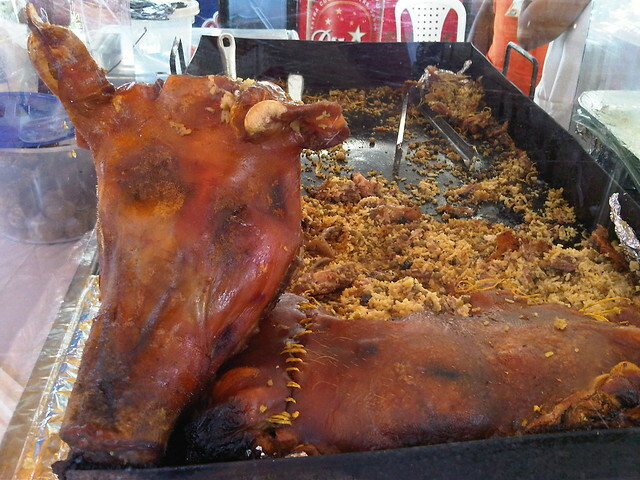 One food vendor was all about the pork! For a more detailed account of the event, from the perspective of serious orchid enthusiasts, check out the write-up on the American Orchid Society website. Dave- You’re reminding me of my time in Medellin, I stopped by the garden one afternoon. I now understand why you chose Medellin as your base.